Coffee is a product of, which is conditional on the boundary between the positive and negative effects on the human body. can say, that to benefit from harm when it is applied, only one step. Moderate consumption of coffee in small quantities, and if there are no clear contraindications for health, can bring some benefits to the body. But excessive enthusiasm for coffee will harm, and considerable. let's consider, Based on what the effect of this drink and why it is not so harmless. 1. The action is based on the coffee contained therein caffeine, being, first of all, psychoactive agent, which can be addictive. therefore, the first thing - coffee causes physical dependence. At a certain addiction to the tonic effect of coffee, may require an increasing number of beverage, spurs because the effect gradually decreases with habituation. Check, whether kofezavisimosti, You can be refused for a time of coffee. If this begins to appear fatigue, headache and muscle pain, irritability, depression, that caffeine dependence is obvious. 2. Coffee is bad for the normal functioning of the nervous system and mental health when immoderate consumption. If the nervous system is always in a position to spur, she feels stress, causing the depletion of the entire organism. May develop aggressiveness, psychoses, depression, insomnia, headaches. 3. Caffeine stimulates the heart and leads to some increase in pressure. It is extremely harmful to people with heart problems and blood vessels. But the negative effect of coffee on the heart is observed even in healthy people, who lead a sedentary lifestyle and overweight, or abusing coffee, drinking more 2-4 cups per day. It is believed, that custard cooking method is more harmful for the heart, than cooking by boiling. 4. Coffee prevents the absorption of useful mineral substances and facilitates their leaching from the body. We are talking about calcium, magnesium, sodium and potassium, as well as vitamins B1 and B6. As a result, poor blood supply to the brain (lack of vitamins), brittle bones and tooth decay (calcium deficiency), pain in the spine (magnesium and calcium deficiency). 5. Coffee is bad on an empty stomach, it increases the acidity, which may contribute to the development of ulcers, heartburn and stomach ailments. 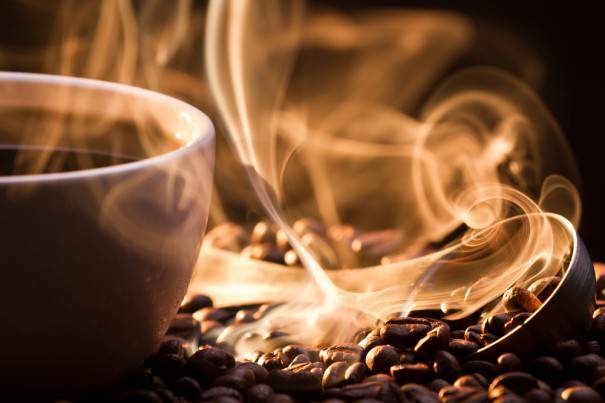 Many people believe, that if they drink so-called decaffeinated coffee, it can avoid the harmful effects on the body. Alas, far from it. Caffeine from coffee beans is usually removed by a special chemical solvent, part of which remains in the product, and may harm. Besides, Caffeine is not completely removed, but merely contains a lower dose. Decaffeinated coffee is bad for the heart and improves cholesterol, contributing to the deposition of fat and excess weight. That's why, so it is important not to get overly coffee, remember its hazards, even for completely healthy people, and completely abandon this is not a harmless drink with certain contraindications.